I finally had some time to paint this weekend. It has been many months since I have picked up a brush. Wow, am I rusty! I hardly knew which end to hold; not working as deliberately as I would like and feeling a little tentative. I'll probably let this one sit for a bit and see if I want to rework it. I painted the study for this one just over two years ago in Idaho. There is always something that I remember in particular about the experience of painting each study. This one I remember that I had a 15 minute time limit, and I remember the day as being a beautiful, calm, warm autumn day. 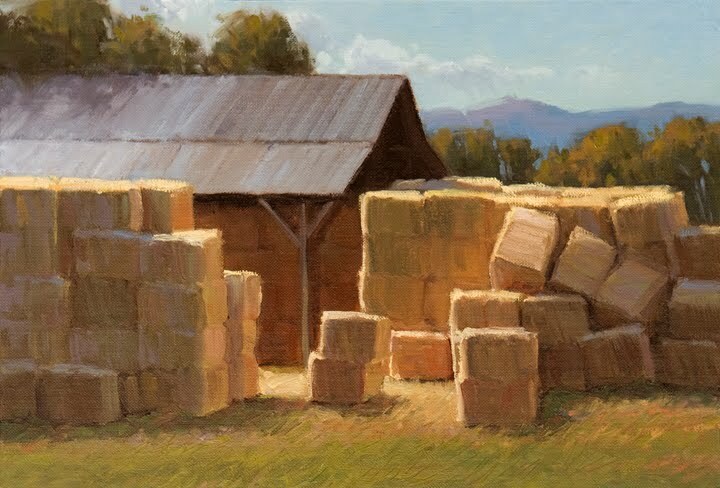 18x13", oil on linen. this is simply gorgeous. you are an excellent painter. Wonderful to see you painting. This is very nicely done. I liked reading about what you remember from the day. It works best if I can bring back a memory, something from a day out painting to help get that feel for the day, otherwise it is just another painting. This looks like a success! The study was one of my favorites. Such a beautiful moment in time. Great to see it transition to a final piece!